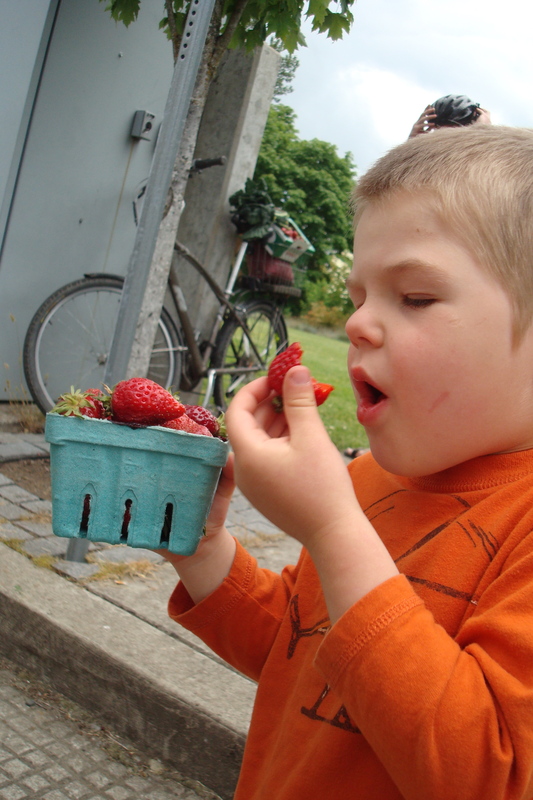 Salvaged berries from the Boones Ferry Berry Farm discards at the end of the Corvallis Farmers' Market Saturday. From the mouths of babes: Little George digs into the ones at the GTF stand. I’m not shy. I have no trouble engaging complete strangers in conversation. Maybe that’s why I interview people and entertain in the front of the classroom for a living. But still I felt awkward going from stand to stand at the farmers’ market Saturday, asking for donations for the cooking and canning classes EMO’s Interfaith Food and Farms program runs to help folks stretch their tight budgets and learn to make delicious meals with food bank staples. Then I happened to ask Boones Ferry Berry Farm (near Woodburn) if they had any mushed or overripe berries we could have to cook up into jam. They gave me their “trash” bag, chock fill of syrupy, slightly squishy berries that smelled and looked delish, though were perhaps not quite pretty enough for discriminating consumers. But no one would know the difference when they cooked down into jam. Fellow master food preservers (and dear friend) Rebecka now heads this cooking class, working closely with Jamming for the Hungry’s Sara Power (who was also in our Master Food Preserver Program). Chef Intaba previously ran these classes when I first moved to Corvallis. These are my girls! That’s where I met Norma, my good friend from Texcoco, Mex., and the mother of three adorable children: Jerry, Michele and baby Dennis. 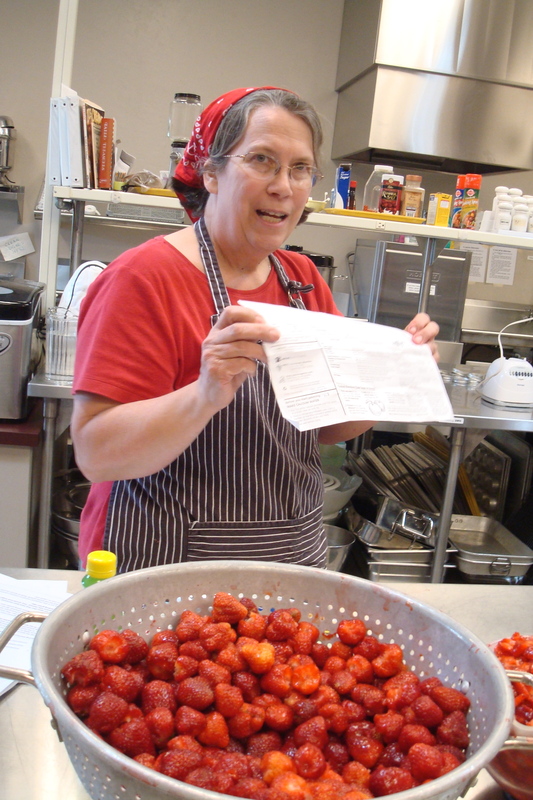 Sara demonstrates her jam recipe. Jerry patiently waits to make jam. Also, if your jam is starting to foam if you cook it, we learned that adding a pat of butter helps, and may keep the jam from turning gray. 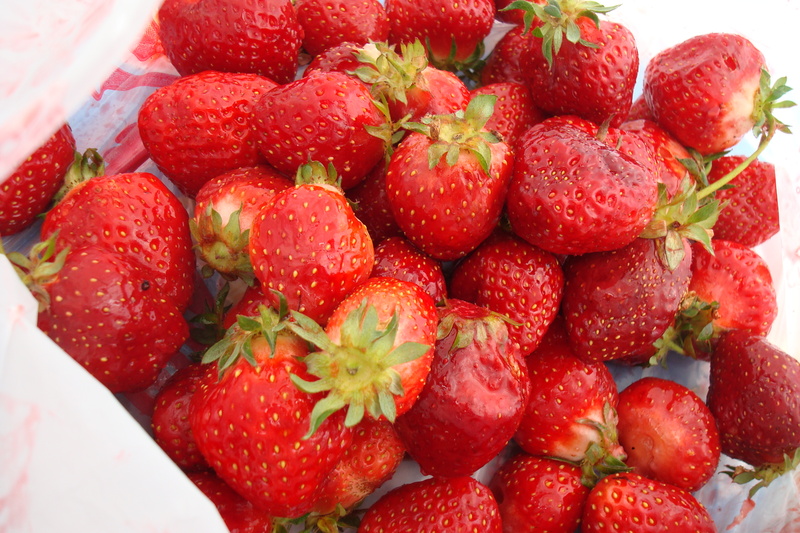 I still might go strawberry picking next weekend, perhaps at nearby Greengable Flower Farm, where they are $1 a pound. Pulse berries in a food processor until finely chopped and very juicy. 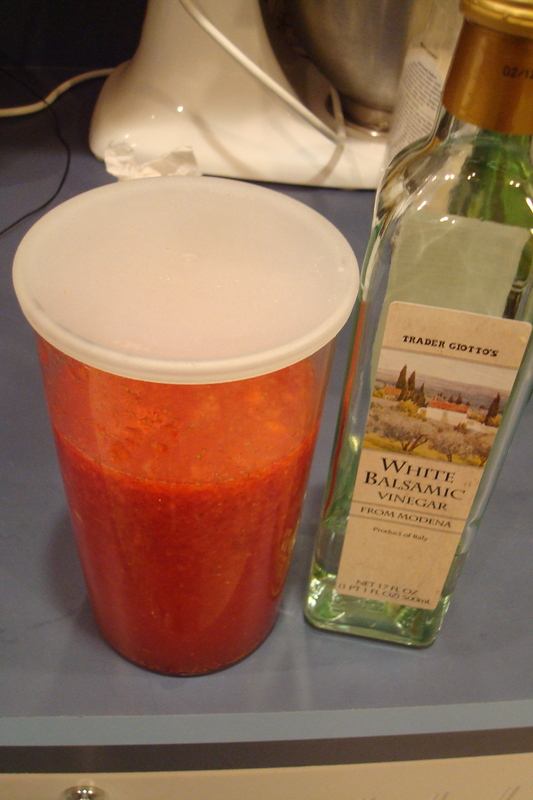 Transfer to a bowl and add vinegar. Strain through a fine-mesh sieve into a jar, discarding solids (don’t strain if you prefer a thicker, pulpy dressing). Keeps in the fridge covered and chilled for a week. Blend ingredients together in a blender, or just shake in a covered jar or beat until mixed and smooth.